Skullcandy TV was on hand when 23 lucky individuals picked up the extremely limited Skullcandy X Jordan Packs from Foot-action in the Westfield Mall. Last weekend, the Jordan Brand invaded Westfied Culver City Mall in Los Angeles for the NBA's All-Star festivities and the launch of the Air Jordan 2011. 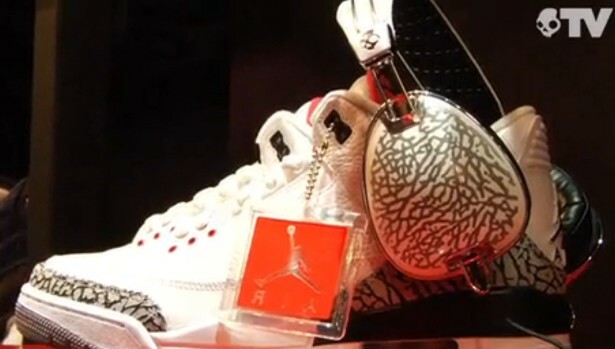 Not only were they present, but they made special merchandise available to lucky customers, including the limited edition Jordan Brand x Skullcandy headphone packs. Designed after the "Cement" Air Jordan Retro 3 and Air Jordan 2011, each set was limited to 23 units and sold exclusively at the Westfield's Footaction location. Check out the video below for a look at the limited release event in LA.